(From the back of the book) Juliet has done the right thing all her life, and where’s it gotten her? She’s a thirty-year-old widow who’s had to move in with her parents. Things start to look up when her glamorous but married neighbor Seth seems to be flirting with her and helps her land a job at a local paper. Maybe she needs to do the wrong thing for once. Or maybe she s headed for disaster. I fell in love with the title of this novel, something you should never do, before it ever arrived at my door (thank you, TLC tours), and that was my first difficulty with this novel. Then, I had trouble settling into it to read. It wasn’t that it was poorly written – in fact Cronin’s prose is eminently readable – just that my own mood was tangled and dark. That was my second difficulty. Nevertheless, after a couple of false starts, I found myself absorbed in the story of recent widow, Juliet, and her new life, which involves a longer-than-expected “temporary” return to her parents’ home in New Haven. I need to inerject here, that I have family – Yalies all – in that part of Connecticut, and Cronin got the flavor of their speech, and the unselfconscious (to the point of oblivion) self-entitlement of a certain class of people spot-on. Little things like Juliet’s use of the word “Mummy” with her mother, which otherwise would have read as British, instead placed us firmly in Connecticut’s upper-upper middle class. 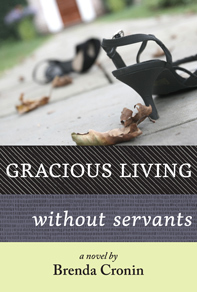 While I enjoyed the story, however, and loved Gracious Living Without Servants, for the way the author crafted it, I found myself becoming frustrated with Juliet’s poor decision making. An affair with a married, older neighbor is one thing, but not discontinuing it when you’re assigned to investigate his wife isn’t something a thirty-year-old woman should make. Ditto the day-dreaming about a possible future with Seth – Juliet isn’t twenty. Shouldn’t she know that men of his ilk never leave their wives? As much as her bad decision making frustrated me, however, I enjoyed the book for what it was. It takes courage, in our instant-gratification culture, to write a book that doesn’t wrap everything up in a neat bow. As well, I particularly liked the way Juliet’s deceased husband, Alex, was a character in his own right, even though he existed almost exclusively within her thoughts – Alex would approve, Alex might not agree, Alex would understand. 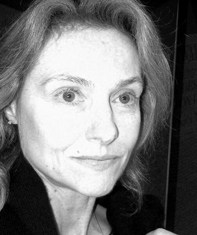 It added dimension to Juliet’s character, as well as to the novel as a whole. I feel compelled to add that I’m reading this with the experience of being 43 and having a marriage that is going on 19 years, and my own experience colors my reaction to this novel, but it’s well written and truly interesting. Goes well with canopes and a glass of merlot. Thursday, October 31st: A Simple Life, Really?